Sprocket rims : SARL Maxima, Specialists in the sale and reparation of machines and accessories for the construction industry. Importer and distributor of both hydraulic and pneumatic equipment. 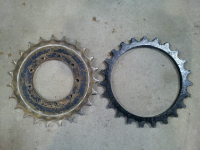 Sprocket rims can be fabricated to suit individual requirements when complete sprockets are unavailable or obsolete.